With Halloween coming soon, it’s time to prepare some new spooky decoration for our home. 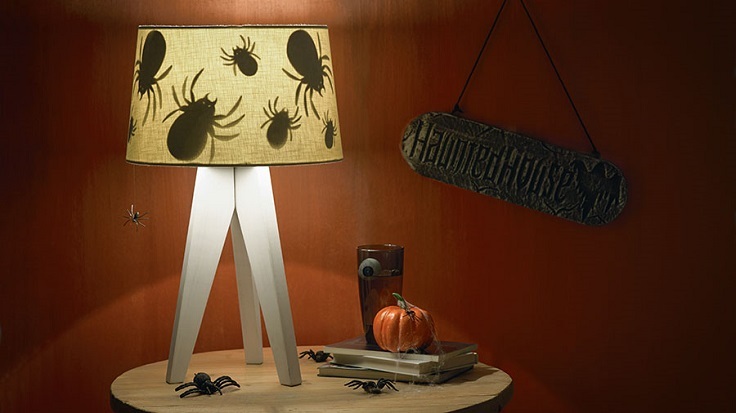 This doesn’t mean spending plenty of money on store – bought decor, but instead being creative and do something budget – friendly that will totally fit the whole spooky atmosphere. Below you will find ten DIY projects that are very easy, cheap and can be done in no time. This is perfect for those of you who don’t have much time, money or creativity – just scroll below and find the decoration that fits your needs. Have fun! Using mason jar for Halloween is one of the best things you can do when it comes to homemade decorations. There are plenty of ways you can decorate them and it’s great that with just a little effort you can come up with an amazing decoration. 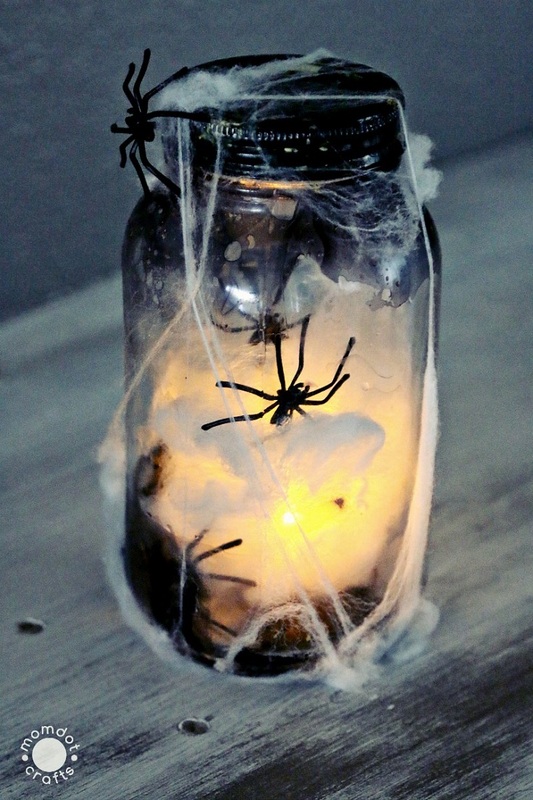 To make such mason jar, you need fake spiders and fake spider web, black nail polish and flameless tea lights. This is the kind of decor that you can put in any room of the house. 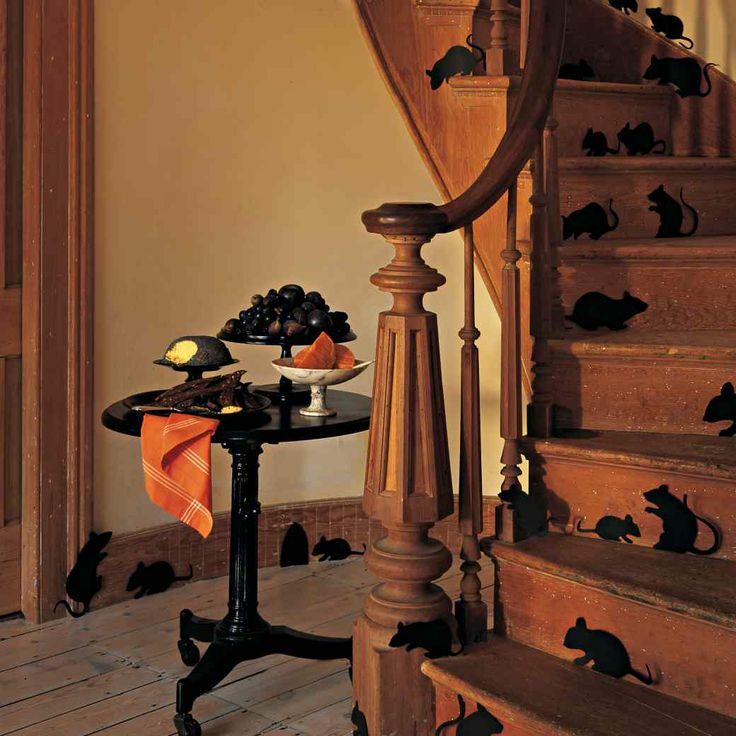 Spooky silhouettes are definitely the must have decor for Halloween, especially if there are spooky creatures involved – who isn’t afraid of spiders and bats and mice? 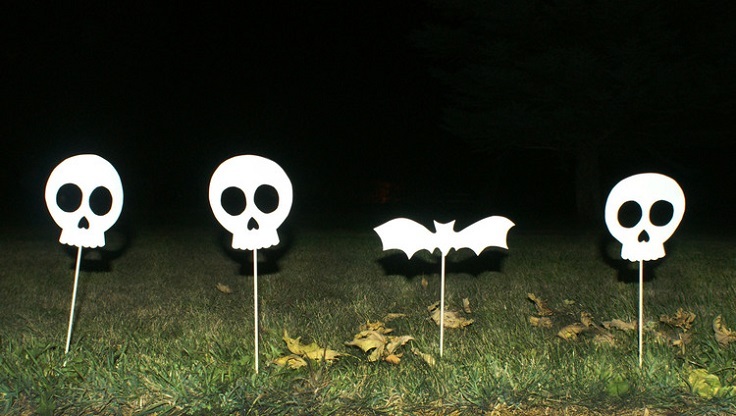 Of course you don’t want any of these really at home, but you can create paper silhouettes and later them attach them to a lamp, so you would get a very spooky atmosphere! It’s very simple, and for this you need spider cut outs and craft glue. 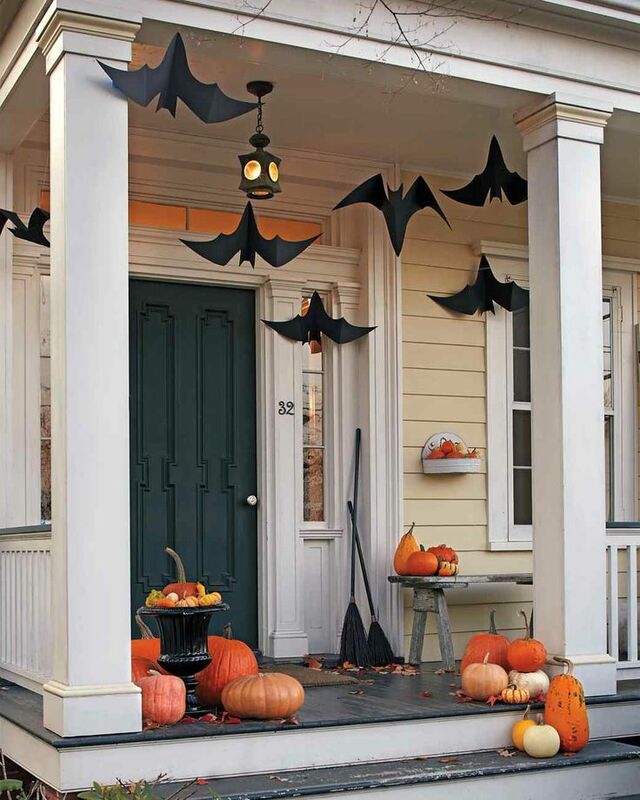 When it comes to Halloween, decorating the outside is just as much as important as decorating the inside. Our garden is a place that leaves us with plenty of decor experimenting! One of the easiest projects that are also budget – friendly are the sidewalk skulls. You can even make these with your family! You need the following materials – White poster board or card stock, scissors or craft knife, pencil, glow in the dark acrylic paint, paintbrush, skewer sticks and masking tape. Here’s another super budget – friendly and super cheap project that will take you just minutes to make it! We’re talking about hanging bats that you can hang somewhere inside the house or outside – or both. For this project you just need four materials – half-bat template, thick black paper, bone folder and painters’ tape or removable hooks. It’s a very easy project and you can make it together with your family – it’s all about having fun while creating! Balloons are a perfect way to add happy atmosphere to any party, including that one on Halloween. 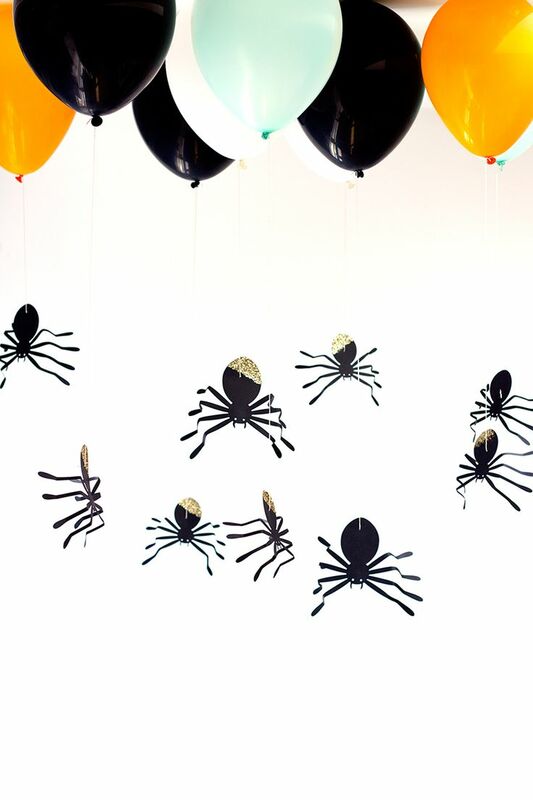 But, instead of colorful balloons, be creative in the spirit of this spooky holiday and come up with something so cool, like this spider balloons! Besides balloons filled with Helium, you need spider crafts, glitter (this one is optional, but it makes things cooler! ), decoupage glue, paint brush, twine and awl. 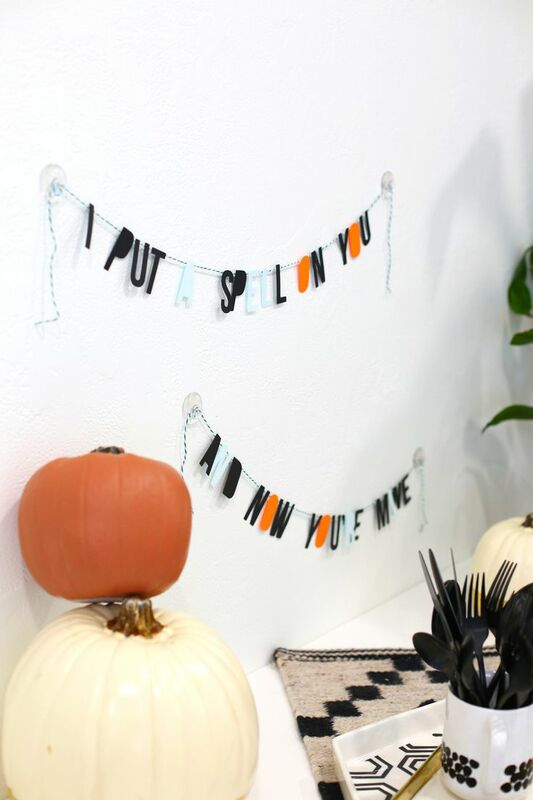 Pick a spooky quote that you like and turn it into a garland! This way you can decorate an empty wall and not include the usual bat, spider or mouse decor. This is a very simple project and it won’t take much of your time. Before you start with the project, get the necessary materials – party banner anchors, cardstock, scissors, glue gun and baker’s twine. You can get store – bought banner, or make your own at home. 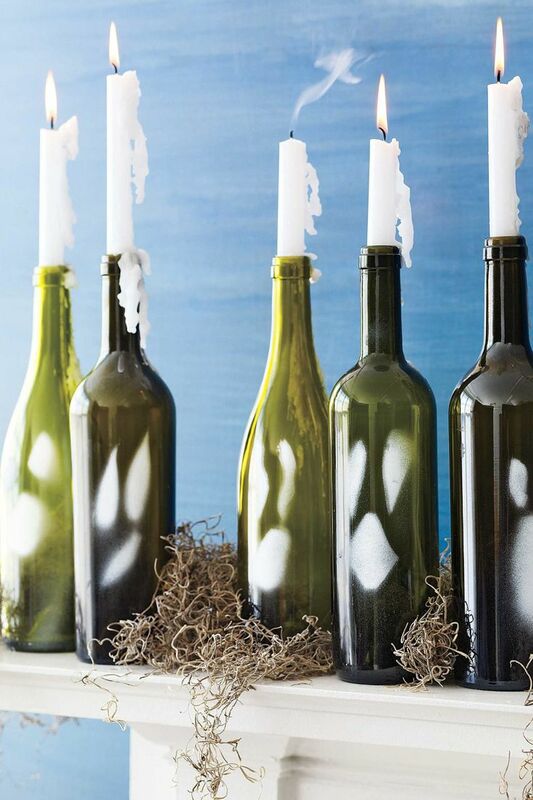 Instead of throwing away old bottles, reuse them and turn them into eco – friendly, spooky Halloween decorations! Making ghoul impressions can turn out to be a great decor, if done the right way, so just get the needed materials and start your own Halloween decorating. This is the kind of decoration that can be places in any room of the house, or even outside on the patio. 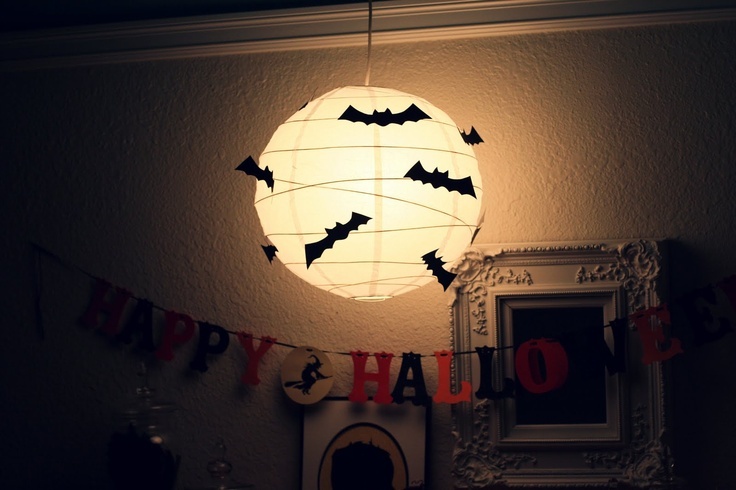 Another fun way you can decorate a room with bats is to place a bat lantern. For this, you need a paper lantern, black card stock or heavy paper, adhesive dots or glue, a bat template, scissors and a pen for tracing and cutting. Once you have your lantern, focus on creating the bats, however you can add more creatures such as spiders or anything that seems spooky to you. The shadows in the room will be amazing! And now it’s time for some stairs decor! For this project you need just few things – black construction paper, pencil, scissors or craft knife, masking tape and mice templates. All you need to do is just print out the templates, trace the mice shape and cut it out. The last step is finding a spot for each mouse and attach it with a masking tape. It’s really that easy and it’s a great last minute idea! One of the best decorations for Halloween that you can make yourself is the candle decoration. 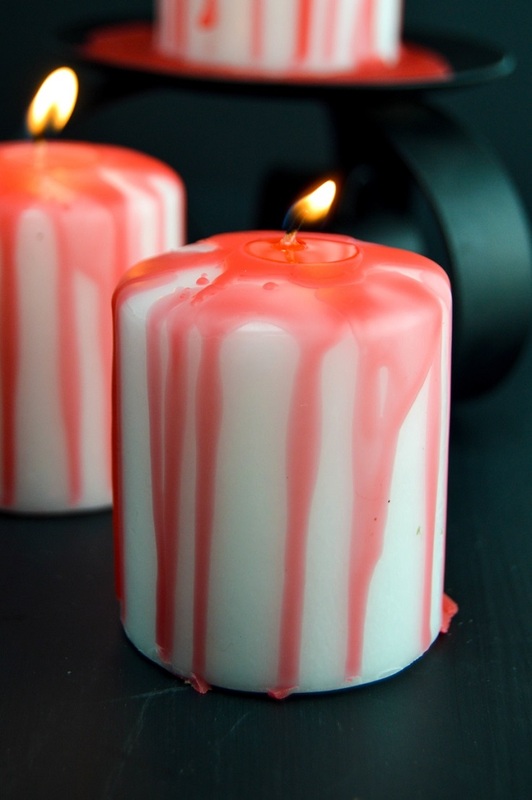 To make it seem spooky, you can play with red candle wax and make it look like there’s blood on the candle! Besides the candles, for this project you will need glass pourable measuring cup and don’t forget to work on parchment paper – you don’t want any table or other furniture to be ruined!